Michael and I generally have the same tastes in food. Of course, there are certain things that one of us loves a little bit more than the other - so Michael will always let me have the last bite of dessert, and I am willing to let him take the extra slice of pizza. There aren't many things that one of us likes and the other truly dislikes, but there is a difference in opinion when it comes to oatmeal cookies. I love oatmeal cookies; Michael doesn't dislike them, but his take is that he would always prefer to have a chocolate chip cookie. So, if hungry and offered an oatmeal cookie, he wouldn't turn it down, but if we're going to make cookies at home he's going to want to go with chocolate chip. This has not been a major source of strife in our household, though, first of all because we're talking about cookies, and second of all because I also happen to love chocolate chip cookies and could never be unhappy if they were around. However, I wanted to make some cookies last week for my knitting club at school, so I saw my opportunity to give the less favored cookie a moment in the sun. 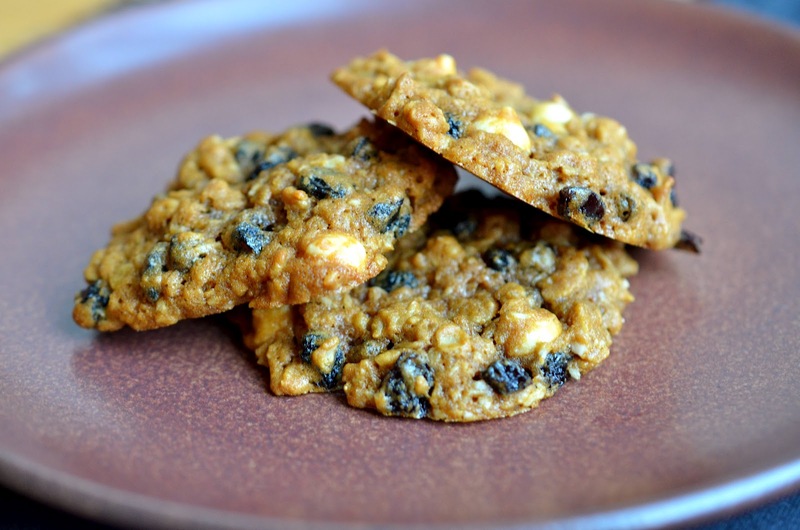 I wanted to make the cookies with molasses, since I think molasses always adds great flavor to baked goods, and I also wanted to use up a few things that we had in our cupboards. I consulted a couple of molasses oatmeal cookies online, including this one from Allrecipes, but I would say that the result, which includes currants, white chocolate chips, and shredded coconut, is my own creation - and I would also say that they came out fantastic. I'm not the only one - Michael also loved them, and the kids at school devoured them. They're chewy, flavorful, and flecked with tiny tart currants and chunks of sweet, melty white chocolate. The oatmeal cookie has finally achieved equal status with chocolate chip! Until a couple of years ago, I didn't know that ramen could be anything more than a package of dry, curly noodles microwaved in a bowl with hot, salty water. Then our friends Grant and Eric from Portland took me and Amanda to an amazing Japanese restaurant called Biwa where we had a life-changing ramen experience. 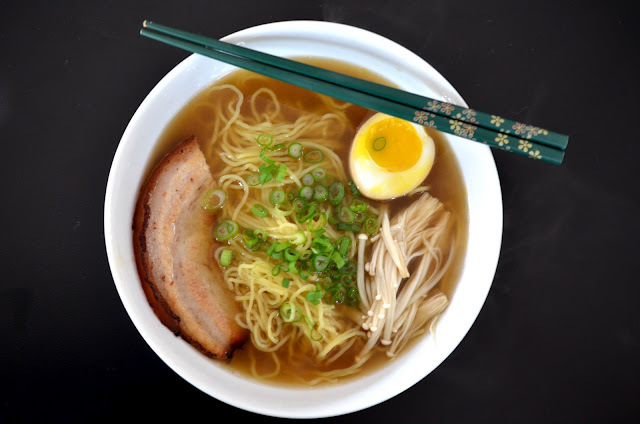 The broth was so deep and rich, the noodles so tender, the pork belly so thin and perfectly crisped. It was during that dinner at Biwa that I learned for the first time that ramen was so much more than those dry, salty noodles. All of a sudden, I started noticing ramen everywhere. The former Namu in San Francisco only made six bowls of it each night because it was so labor intensive. On a business trip to Tokyo, my clients made sure to take me to their favorite ramen joint in Shibuya. And then, of course, there's the movie Tampopo, a Japanese foodie western (yup) all about ramen and the love of food.